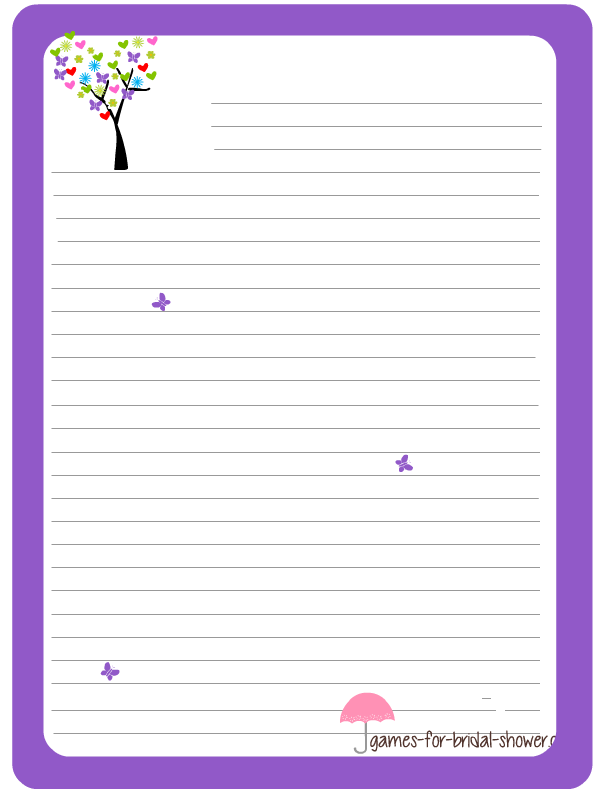 I have shared free printable graphics for around 30 bridal shower games on this site but still if you come up with some different game that requires paper then add more colors and fun to your party by using this free Bridal Shower Stationery that I am sharing on this page. I have made these designs in 3 different colors so you can print any color that matches your bridal shower party's theme more. Click on the image shared above and a bigger image will open up. Right click on that image and save that to your computer. This beautiful stationery design is decorates with a tree full of hearts and it has a colorful and bright pink border. I am sure your guests will love playing games on it. This stationery design has a brown border and it is decorated with image of a tree, butterflies and lots of hearts. Print this design if it matches the theme of your bridal shower party. If purple color is more suitable for your bridal shower party then save this stationery with a purple border. If you have any queries in mind, feel free to write to me using this form.